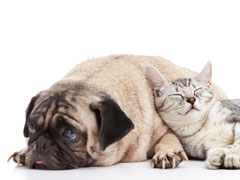 The use of local (also called regional) anesthesia provides benefits for your pets. Local anesthesia allows a lower amount of general anesthesia agents. This improves overall safety! Local anesthesia improves blood pressure regulation intra-operatively, and contributes toward more rapid anesthetic recovery. Additionally, local anesthesia provides analgesia (or pain relief) for several hours in the immediate perioperative (after unconsciousness) period. Finally, the use of local anesthesia provides improved pain relief that works synergistically with other medications such as opiods (narcotics), alpha-2 agonists and NSAIDS (non-steroidal anti-inflammatory). Dr. Kressin and his team prefer to use Marcaine as the agent for local anesthesia. It is safe, effective and lasts a few hours for most pets. Summary: The use of local or regional anesthesia contributes to patient comfort, shorter anesthetic recovery, and improved owner satisfaction about the quality of their pet's recovery from anesthesia. Dental care is continuous with home care teeth brushing and future professional (COHAT) evaluations.